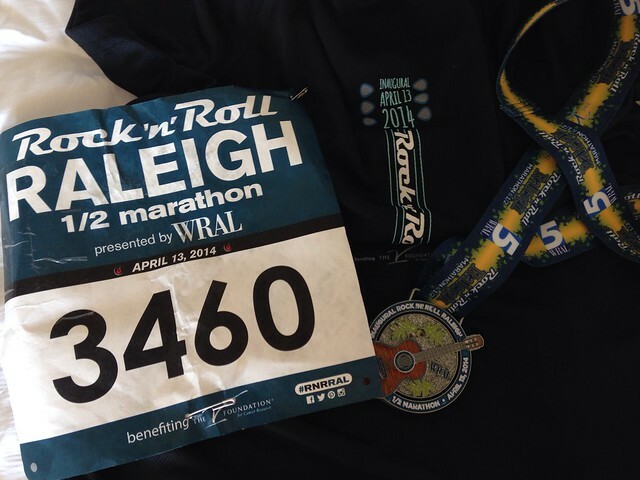 On Sunday I ran the Rock'n'Roll Raleigh half marathon. I can't post this recap and my thoughts about the race without starting off by saying that my thoughts are still with the families of the runners that passed away within the last miles of the race. Running is something that we all do for fun because it's a healthy hobby, so deaths at races just seem wrong. This study done on the London Marathon suggests that 1 in 80,000 finishers will die of a cardiac complication during a marathon between mile 6 and 26. That means that if you run enough races over 10k, you'll eventually run one where someone passes away. This was the third time I have run a race where someone has passed away, and the second time I remember seeing it happen. The first was in my first race, the 2007 Army Ten Miler. I was running in my mom's bib, crossing 14th street bridge, just a mile from the finish when they were loading someone into an ambulance. 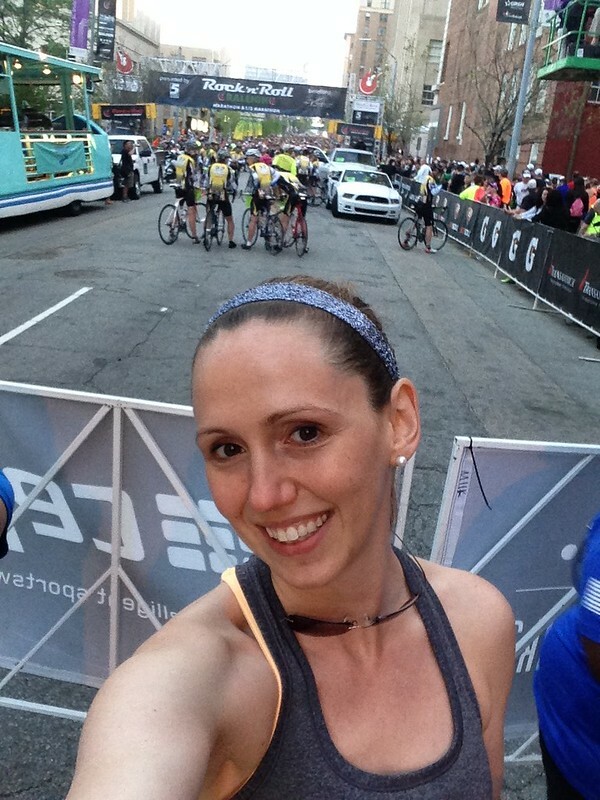 Then in 2012 at the Cherry Blossom Ten Miler I saw the ambulance at mile 9 and learned later that someone had died there too. But I will never forget what I saw on Sunday. 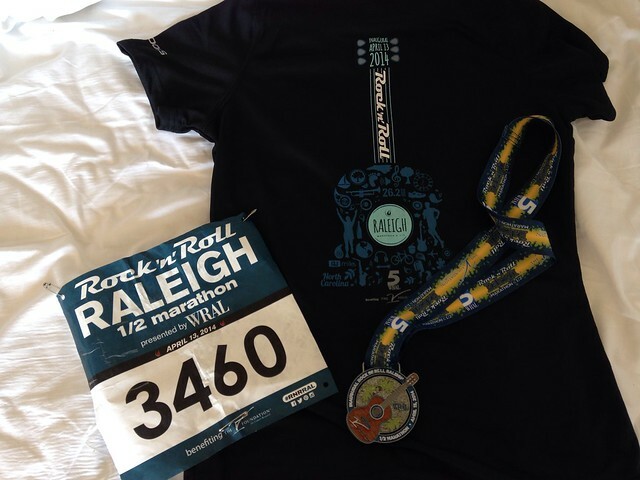 To start things off, it was my idea to run the Rock'n'Roll Raleigh half marathon nearly a year and a half ago, when they first announced that they were doing one in Raleigh. My mom and I signed up, with plans to see her cousin T that weekend too. Then I got an invite to my friend's bridal shower in Richmond for the Saturday before the race. I was thrilled because it seemed to be perfectly timed that I could drive to Richmond for the shower, stay two hours, and make it to Raleigh by 5:30 to get my number from the expo. Unfortunately it meant that I wasn't going to be able to meet up with my mom's cousin, but on the bright side, it did allow me to hang out with Reid, Josh, and Jenny on Friday night. I got up bright and early on Saturday morning and coached the age group advanced/elite swim practice, then headed home to get ready for my road trip. I got all gussied up for the shower and set off from Reston at 9:30am, building in an extra 15 minutes, or so I thought. Traffic was HORRENDOUS on 95. It took me over 2 hours to get to Stafford, so by the time I made it to Richmond, around 2pm, I had to head directly on to Raleigh. My mom even tried to pick up my number for me, but unfortunately the Rock'n'Roll races don't allow other people get your numbers for you, with the exception of USA and Philly. By the time I pulled up to the convention center, there were signs on the door saying that the expo had closed and that I would have to get my number the next morning at 5am. Luckily, there was someone exiting as I was standing there and they let me go and pick up my number and shirt. It was weird seeing an expo being broken down and I was lucky in two other regards - 1)that I didn't need anything and 2)that I didn't have a chance to spend any money at the expo! We were staying at the Marriott, right by the finish line, so after maneuvering through the closed roads, I met up with my parents and got settled into the hotel. Let me tell you, after a long drive, there is nothing better than relaxing on a Marriott bed! About an hour later we walked down to The Pit, because it had amazing reviews for gluten free, for dinner. I was beyond happy to get to have BBQ for dinner! The restaurant was amazing, and we were lucky to avoid a 40 minute wait by snagging a table outside. 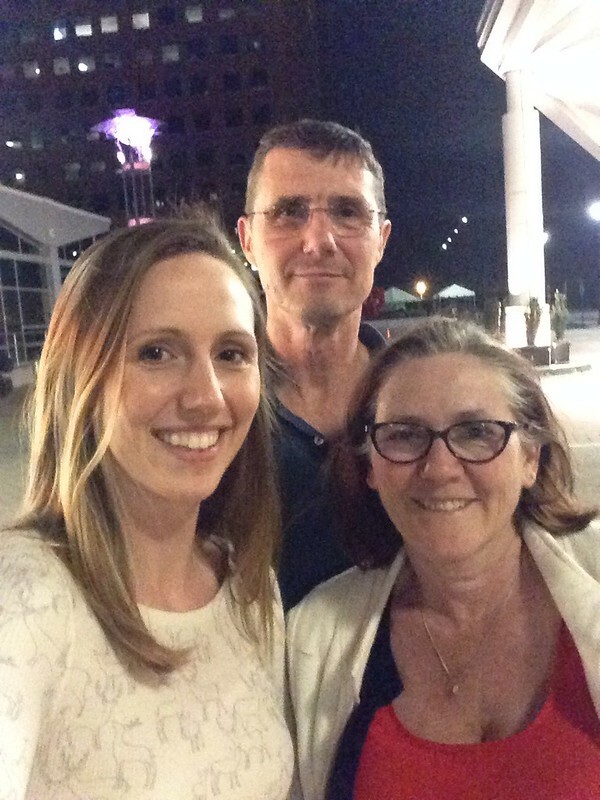 I took the above selfie of me and my parents on our walk back to the hotel. 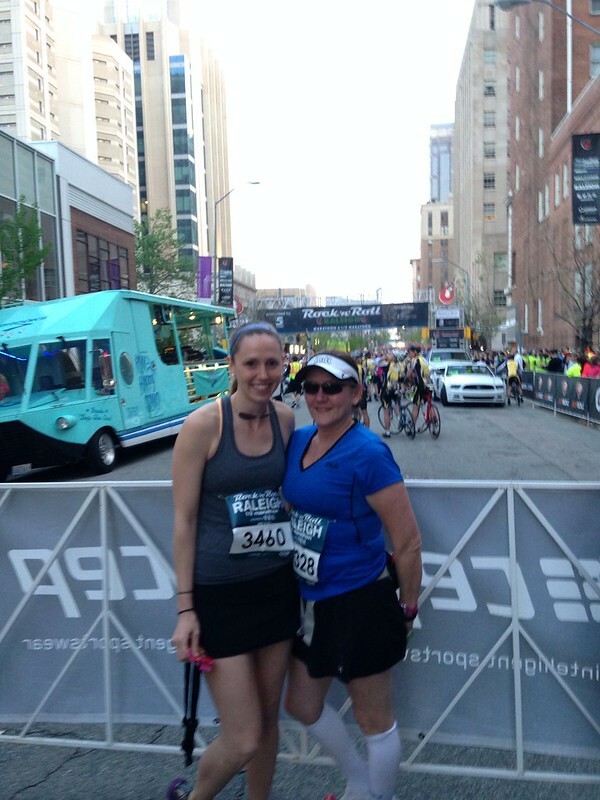 This was the first time that I have ever stayed right at the start/finish of a half marathon. It was very much like when I run the PRR races that start and finish at South Lakes (like this one, this one, and this one), I pretty much just got to roll out of bed a go down to run a race. My dad walked me and my mom over to the starting area and we took a couple of photos. I also showed my mom how to take a flattering selfie. It was a fun and lighthearted way to start a race. I was in corral 3, so my parents left me there as they went back to where my mom was supposed to line up, in corral 17. I chatted with some nice guys in my corral who were doing the full marathon as we waited for the start. One of the nice things about the Rock'n'Roll races is that they do an official start for every wave/corral. They do a good job of making everyone, from the fastest person to the slowest person, feel special! When my wave started I took off, trying to repeat my pace from the ten miler the weekend before. 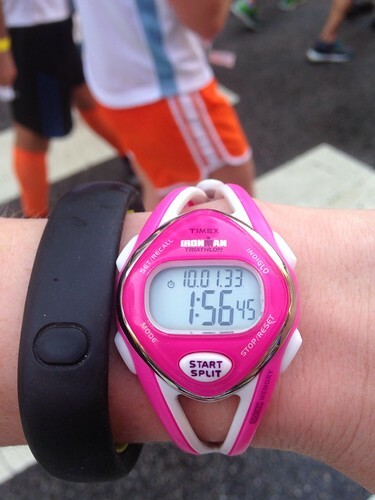 My legs felt tight and heavy, but I pushed through, thinking about how they'd feel better when I warmed up a bit. I went out way too fast for such a hilly course though. On the bright side, my 5k split was a 2014 5k PR of 24:45! I even held on for a pretty nice 10k split of 52:24, but it was all down hill from there, mostly because the race was all up hill! I remember thinking at mile 2 that I really needed water. I knew the water stops would be about every 2 miles, but with the humidity, I could have used them more often. I should have learned from the Rock'n'Roll USA and brought my water bottle with me. Lesson learned here - always carry my own water. I remember hearing someone say that they were skipping the first water stop and I wanted to tell them they were stupid. It wasn't super hot by then, but it was really humid. And I know that you don't feel thirst on a run until it's too late. I struggled through the race, taking a lot of walk breaks, drinking full cups of both water and gatorade at every stop. I had two gu packs with me and took one at mile 5, the one provided on the course around mile 8, and my last one around mile 11. I really tried to run harder after the 10 mile mark, but it just wasn't happening. My feet burned and my calves felt like they were just about to cramp up. When I came to the hill where the 11th mile marker was, they were ushering people over to the left of the course so that a medical truck could also get up the hill. When I rounded the corner I saw EMT's giving chest compressions to a man that was lying on the road (here is the link to the story about him). I couldn't look away and actually fought the urge to go and offer to help, realizing that there was nothing I could offer with my lifeguard and CPR certifications that the EMT's didn't have covered. So I ran by and watched. I watched the compressions go deep and move his stomach with no muscular resistance as I passed his feet. There was an EMT swabbing his leg to try to start a line to give him fluids. As I rounded the corner I saw the team working on him. He had AED pads on his chest as the compressions continued and another EMT used a bag/valve mask. You only continue compressions after the AED arrives if the heart is in an unshockable rhythm. I knew he wasn't going to make it, but I prayed I was wrong. As I kept running, two medics started running up the right side of the road and there was another man down on the course. He was sitting up and being attended to by two other runners. As I arrived there, the medics did as well. So I kept going. 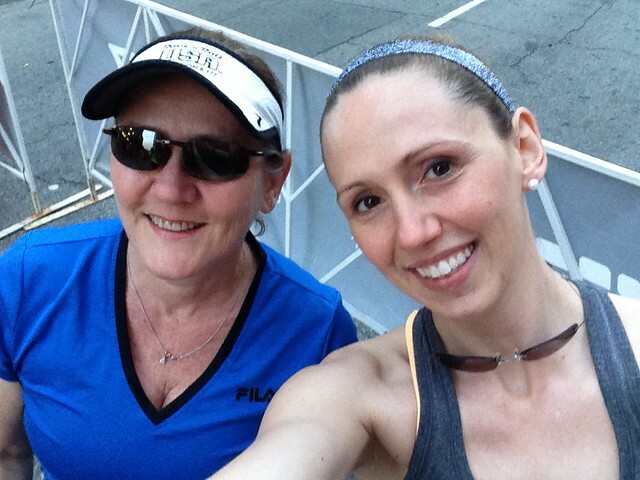 I saw another person down and conscious getting medical attention before I crossed the finish line, and another two while I walked back to mile 12 to meet my mom. It's the first time I have seen so many people down at one race. Little did I know, as I was walking back to meet my mom, another runner collapsed near the finish line and died after 20 minutes of CPR on the course. I crossed the finish line with an official time of 1:56:44, not great, but when a race feels hard the entire time, I'm just happy to be sub 2 hours. I actually felt pretty good after I finished and I started walking back along the course so that I could run the last mile with my mom. I did my usual "you look amazing" and "way to rock this" cheering as I walked back and all the spectators commented on how good I was at cheering. I think it's partially because it's what I want to hear, but it also comes from being a coach to little ones. On the walk back I saw a few more people (2 or 3 maybe) down along the course getting various medical attention, but it looked like all were conscious. That is one thing I have to say about this race. Though I saw more people need medical care at this race than at any other, they were all getting it from race medics and EMTs. The medical staff at this race were on point. I have mixed emotions on whether I will do this race again. On the one hand, I really liked staying at the start/finish area. The Marriott staff were amazing and the race was very well organized. The course was hilly and challenging, and now that I know that, it would fit in well with as a "training" half with the Nike (which is flat and fast) as the goal race. But with what I witnessed, I don't know how I would feel running it again. As I said earlier, death is not something you think about when you sign up for a race. Runners are trained and most are in peak physical health. But there are risks with running. It pushes your cardiovascular system towards its limits, and if there is just one thing that is off, death is possible. Both the men that passed away at the race were in their lower 30s. They suspect that they both had undiagnosed heart abnormalities that lead to their deaths. That was the case of my friend's husband who passed away after finishing the Rock'n'Roll Virginia Beach Half marathon a few years ago. It makes me think that as much as running is healthy, there is also some inherent danger. To minimize the risks its important to make sure you know what they are. Hydration and keeping your electrolytes balanced is crucial. Someone from the half fanatics said "be your own aid station" and I thought that really made sense. I remember thinking that for the weather and feel (hills) of the course, I could have used both water more often and gatorade earlier than mile 4. Getting your heart checked and getting a physical are also super important. Simple cardiac physicals and screening tests can identify issues before they become problems. Because with a lot of undetected heart defects, the first symptom is sudden death. 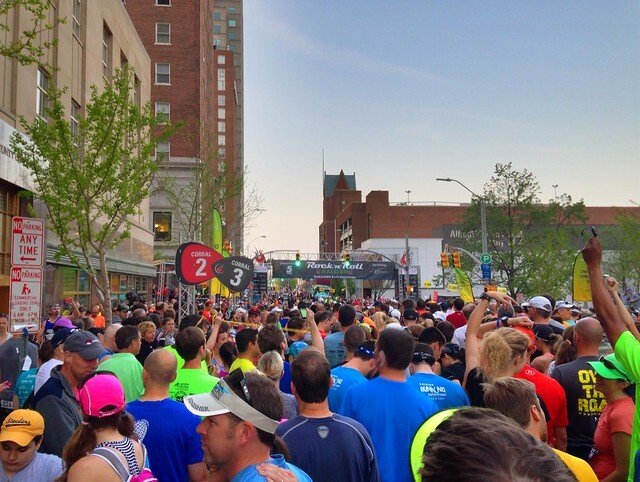 But what I have to remember about these two men who passed in Raleigh this weekend (and all the other people who have died at races) is that they were runners. They were like me. 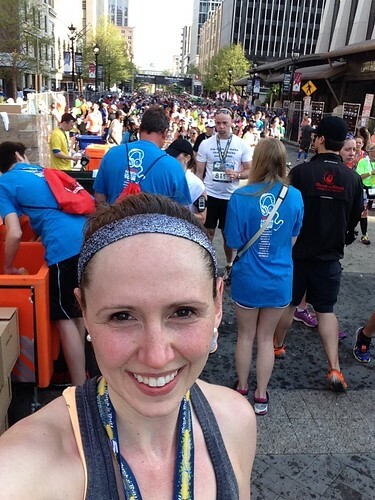 The running community will mourn their loss, but we will run on. They would want us to run on, because that's what runners do, we run.